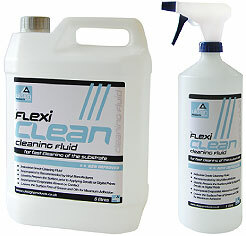 Flexiclean Isopropanol Cleaning Fluid for fast substrate cleaning prior to vinyl application. Sign Makers Industrial Strength Isopropanol is recommended by vinyl manufacturers as the only fluid that should be used to prepare the surface prior to applying decals or digital prints. Flexiclean evaporates almost on contact leaving the surface free of grease and oils and prepares your surface to allow maximum adhesion of the vinyl. Dont forget your other Sign Making Chemicals. You can order your FlexiPrep Vinyl Adhesive Remover and FlexiSlide Vinyl Application Fluid in our Sign Makers Chemicals section. We aim to get your order to you as soon possible, normally next working day of placing your online order unless otherwise stated; we will send an e-mail confirming your order straight away with a unique reference. UK Sign Products Standard Conditons of Sale apply to all orders.